A question hovered over the Alvin Ailey American Dance Theater as it swept into the Bay Area on its latest national tour: How will it fare after the retirement next year of Judith Jamison, the former company soloist who as director has nurtured the Ailey legacy for more than 20 years? The answer was evident from the works onstage, not to mention the exuberant reaction of the audience. The dance troupe apparently will barrel on successfully for at least another 20 years, spurred by the works on this program—two local premieres and a rousing rendition of the signature “Revelations.” The distinctly populist vein the company embraces notwithstanding, some surprises will surface as well. The nine scenes of “Uptown” come and go with inexplicable urgency—at times, it’s like watching a silent movie projected at the wrong frames per second—and yet the clap-happy, high-kicking dancers make the breathless revelry infectious (as witnessed by the many eruptions of applause). 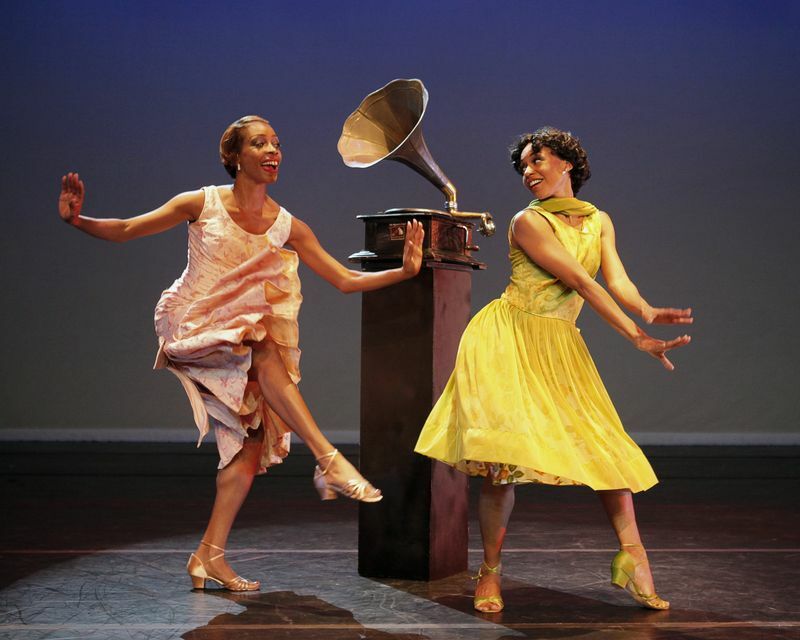 At one point, they rush in to execute a double-time lindy hop, then depart for a quick costume change while a soloist performs expressive moves to the words of DuBois or Hughes or Hurston (Briana Reed in the latter segment adds some welcome and delicate poignancy). Incarnations of major entertainers also appear, bedecked in get-ups that edge uncomfortably toward Hollywood excess—Josephine Baker festooned in feathers and sequins; Ethel Waters wrapped in red and pink boas; Florence Mills poured into a hot-pants tux—without providing much characterization in their standardized bump-and-grind routines. But these hitches never really hinder the parade of fast-paced scenes that exhibit the company’s versatility and polish. The dancers, all of them classically trained, function brilliantly as an ensemble, nowhere more appealingly than in the Cotton Club finale. Both Ailey and Jamison emphasized a whole-body approach to dancing, and we see that here in dozens of fleet feet and jubilant arms—an all-out call to mirth that defines both the jazzy era and the swing it inspired. After the easy and accessible “Uptown,” the program takes a more serious turn in its second new work. “Dancing Spirit” makes you think, and it’s a welcome chore. Longtime dance-maker Ronald K. Brown plays with theme and variation here, arraying his indigo-and-white-clad dancers (effective costumes by Omotayo Wunmi Olaiya) along a diagonal from upstage left to downstage right, and though the music changes abruptly, the transitions never falter as the Ailey dancers seamlessly move into the piece, one going offstage as another comes on. It’s an appealing device, and Brown adds a freshness to it—a different arm position here, another extension there—as he works through a number of styles, from moody jazz by Wynton Marsalis to updated Duke Ellington to bossa nova to Afro-Cuban. “Dancing Spirit,” which is also the title of Jamison’s autobiography, is intended as a tribute to her, so a lot of virtuoso technique is on display, in both the classical steps as well as the more unbridled forms evoked by the music. These dancers, again working in exquisite tandem, perfectly exhibit the African underpinnings of Brown’s choreographic urges, unafraid to move more than one body part at a time. Jamar Roberts and Rosalyn Deshauteurs add moments of technical virtuosity, but all nine dancers really soar. They bring, each one of them, their own spirit to the dance, honoring Jamison in the process. What new perspective can be brought to “Revelations” except to say that it is still stirring enough to warrant further viewing and examination 50 years after Ailey created it? It is everything it was in 1960 and now more, having been so arduously revived year after year by Jamison, who could not help reinforcing Ailey’s version with visions of her own. And so, there are times in “I Been ’Buked” when the arched arms and shoulders of the dancers seem to lift them off the stage, when the coupés jetés of “You May Run On” appear to make them airborne. And there is a breathtaking moment in “Fix Me, Jesus” when Linda Celeste Sims extends her leg almost straight over her head and performs a tour de promenade that looks at once impossible and perfectly natural. Rather than becoming a relic, “Revelations” continues to reveal itself as a dance that resists atrophying into cliché. This is a considerable achievement, and it explains why this dance in particular and the Ailey company in general will persevere.